A number of factors about the A8-7670K processor suggest that this is "another release of the same sort of stuff," albeit with increased frequencies. Nevertheless, we put the processor through our regular tests, to see what would happen. Our bench suite this time had one omission and one addition. For whatever reason, Linux Bench refused to run, with Ubuntu 14.04 throwing a hissy fit and not willing to start. I’m not sure if this was a BIOS issue or something more fundamental with the software stack, but it was odd. The addition, as the title of the review alluded to, is a Rocket League benchmark. At this time, we haven’t run it on many systems, but the A8-7670K is the sort of APU that enables games like Rocket League. Rocket League is a good contender for our 2016 CPU/APU benchmark suite on the integrated graphics side of things, and this serves as a good tester in the wild. All of our regular benchmark results can also be found in our benchmark engine, Bench. Rocket League will be added in the future with the 2016 updates. Thank you to AMD for providing us with the R9 290X 4GB GPUs. Thank you to ASUS for providing us with GTX 980 Strix GPUs and the R7 240 DDR3 GPU. Thank you to ASRock and ASUS for providing us with some IO testing kit. Thank you to Cooler Master for providing us with Nepton 140XL CLCs. Thank you to Corsair for providing us with an AX1200i PSU. Thank you to Crucial for providing us with MX200 SSDs. Thank you to G.Skill and Corsair for providing us with memory. Thank you to MSI for providing us with the GTX 770 Lightning GPUs. Thank you to OCZ for providing us with PSUs. Thank you to Rosewill for providing us with PSUs and RK-9100 keyboards. Power consumption was tested on the system while in a single GTX 770 configuration with a wall meter connected to the OCZ 1250W power supply. This power supply is Gold rated, and as I am in the U.K. on a 230-240 V supply, that leads to ~75% efficiency at greater than 50W, and 90%+ efficiency at 250W, suitable for both idle and multi-GPU loading. This method of power reading allows us to compare the power management of the UEFI and the board to supply components with power under load, and includes typical PSU losses due to efficiency. The TDP for the A8-7670K is up at 95W, similar to many other AMD processors. However, at load, ours drew only an additional 83W, giving some headroom. For this review, we even tried our hand at overclocking on the MSI A88X-G45 Gaming motherboard and managed to get 4.6 GHz stable. Our standard overclocking methodology is as follows. We select the automatic overclock options and test for stability with POV-Ray and OCCT to simulate high-end workloads. These stability tests aim to catch any immediate causes for memory or CPU errors. For manual overclocks, based on the information gathered from previous testing, we start off at a nominal voltage and CPU multiplier, and the multiplier is increased until the stability tests are failed. The CPU voltage is increased gradually until the stability tests are passed, and the process is repeated until the motherboard reduces the multiplier automatically (due to safety protocol) or the CPU temperature reaches a stupidly high level (100º C+, or 212º F). Our test bed is not in a case, which should push overclocks higher with fresher (cooler) air. MSI’s motherboard doesn’t allow fixed voltages to be set but prefers to rely on an offset system only. There is a problem here that we are also fighting a DVFS implementation, which will automatically raise the voltage when an overclock is applied, with an end result of stacking the overclock voltage offset on top of the DVFS voltage boost. On our cooling system, the processor passed quite easily up to 4.6 GHz without much issue, but 4.7 GHz produced an instant blue screen when a rendering workload was applied. Hitting 4.6 GHz on a midrange AMD processor is quite good, indicating our sample is some nice silicon, but your mileage might vary. If AMD really could get a 40% single threaded performance boost on their CPUs for Zen, and they can do it no later than Kaby Lake, then they really might get a moment to breath. That puts single threaded performance right around Intel's i3 parts, and would put multi-threaded performance (and likely graphics although that's a different story) well ahead. It's not going to take back the desktop market overnight, but it would be enough to get PC builders and maybe some OEMs interested and get enough volume moving for them to survive. You seriously think AMD is going to sell a 4 core Zen processor for the same amount that a dual core Intel i3 sells for? In that case I got a bridge to sell you! Make no mistake, AMD doesn't sell cheap APUs out of the goodness of their hearts. The reason they're the budget option is because they don't have anything remotely competitive with Intel's Core CPUs, and therefore only can compete on the very low end of the market. If their Zen core turns out to be on par with an intel processor, they'll sell it at the prices Intel charges, or slightly lower. 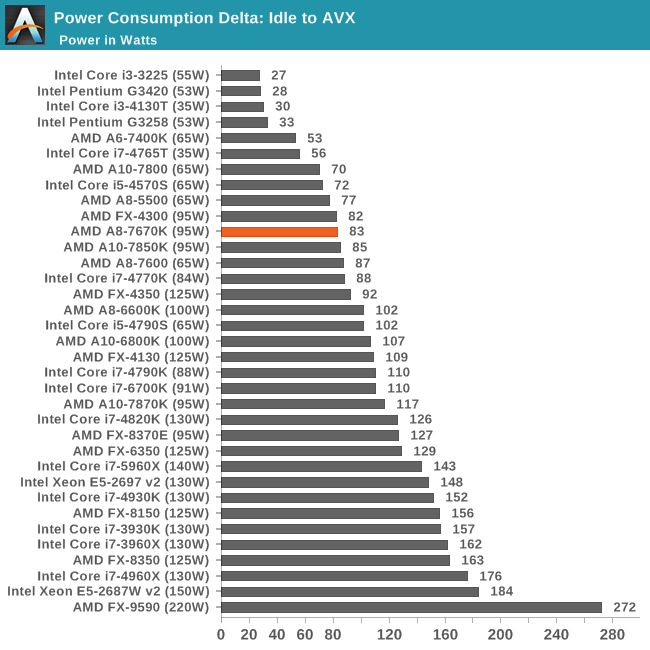 Yes, AMD's IPC is much lower than Intel's, and there's a gap in energy efficiency (although, much reduced with Carrizo). But, as you correctly indicate, AMD prices they chip accordingly. So at ~120usd, the A8/A10 are extremely attractive, in my opinion. For home users, which have the PC on on a relatively small fraction of the time, having more cores, and an excellent GPU (compared to intel's at those price point) is quite beneficial. If Zen is as good as advertised, then AMD can afford to increase the price of their CPUs by 20%. This would make their quad-cores in the $130-150 range, way cheaper than Intel's i5s. Granted, even Zen won't be as good as Kaby Lake. If AMD's performance per clock is 60% of Intel's, then Zen's will be about 84% of Intel's. Add in that a much better power efficiency (because the microarchitecture will have fewer pipeline stages) and possibly more cache with the smaller process node and you get roughly 85% i5 performance for $30 less. This doesn't even consider their APUs, which still could be priced at near i3 levels. They would beat the crap out of i3s and sometimes i5s (if HSA is utilized). "Bottom line: Zen is AMD's last chance. AMD probably won't make the stupid mistake of pricing their CPU's too high. If they do, then bye-bye AMD for good."